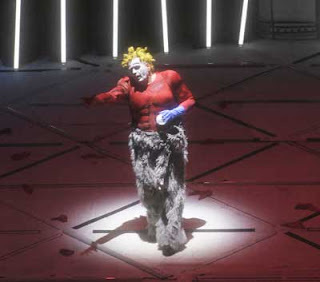 As Wagner fans all over the world know by now, the Los Angeles Opera is engaged in an audacious two-year project to stage Achim Freyer's postmodern version of the Ring Cycle. Having attended the first three operas in sequence, Georja Umano and I just sat through Gotterdamerung, the last installment, which shows the destruction of the gods, in five hours and twenty minutes and two intermissions. Read our review for LASplash here: Gotterdamerung Review - A Thrilling End to the Ring. But back to Siegfried. Why does the hope of the world run onto his own sword? I don't know. I'm asking. P.S. Los Angeles Opera will present three more cycles of the Ring, starting in late May and running through the month of June.